Tori Roloff took to Instagram to share that her son, sweet baby Jackson Roloff, had experienced a medical scare. 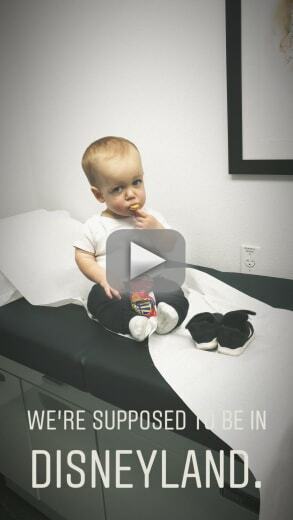 Instead of going through with their Disneyland plans, Tori had to take her baby to a doctor. "We’re supposed to be in Disneyland," Tori shared with a heavy heart. As her fans and followers could immediately see, they were instead in a doctor's office. Jackson, she revealed, had "got nursemaid’s in line for Peter Pan." She is referring to nursemaid elbow, a condition that usually appears in toddlers and preschool-age children in which a ligament falls out of place. The painful condition usually arrises when a child is lifted by or near the wrist. Also known as pulled elbow or, more formally, as radial head subluxation, this can usually be treated pretty easily at the doctor's. This story does, ultimately, have a happy ending. Tori reveals in her Instagram Stories that Jackson's condition "had already been reduced by the time we got to Urgent Care." "But," she continues. "We got him checked out anyway." That is the correct course of action. Children with nursemaid elbow will sometimes hold their arm immobile in order to avoid the pain that comes from moving it. That does not mean that the symptoms are gone. And, in general, if your small child is suddenly in pain, you want to make sure that it's over — for their sake. Tori shared a longer post, summarizing the entire ordeal — and the happy ending. "What a day,” Tori began. We've all had days that end with that line. “It started out pretty miserable," Tori explained, then pivoted: "Actually, it was great at first." Tori wrote that she enjoyed "driving to Disneyland." She added that they made haste to "getting in line for our favorite ride (Peter Pan)." "That’s where things went south," Tori explains. "Jackson is prone to nursemaids elbow," Tori explains. Some children are more prone to it than others — and we're not referring to mistreatment by a caretaker as the cause for the propensity. Tori speculates that it "could be a dwarfism thing or it could just be a Jackson thing." Different children develop at different rates, so some elbows may be more prone to this condition. But, at the same time, some kids are just a little more rambunctious. "He was pulling away from me in line," Tori explains. "And it happened." "I knew right away that we were in trouble," Tori shares. "And Jackson would need to see a doctor." The only good thing about having a kid who is prone to the condition is that you know how to deal with it after that first time. "I was so bummed,” she admits. “We got to go back to Disneyland," she adds, after their trip to see the doctor. She says that things were better then, writing: "(with lots of cuddles and some Tylenol behind us)." As you can see in the video that we have included, Jackson got to watch Mickey Mouse put on a show, and was back to his happy self. He also met Mickey and, when offered a five, left Mickey hanging. Shannon Beador: Feuding with Tamra Judge Over Friendship with David Beador? Kylie Jenner to Jordyn Woods: Let’s Work It Out, Girl! Previous story Josh Murray: My Bad for Comparing Andi Dorfman to The Devil!